Henry Moore was an English artist. He is best known for his semi-abstract monumental bronze sculptures which are located around the world as public works of art. His forms are usually abstractions of the human figure, typically depicting mother-and-child or reclining figures. Moore’s works are usually suggestive of the female body, apart from a phase in the 1950s when he sculpted family groups. 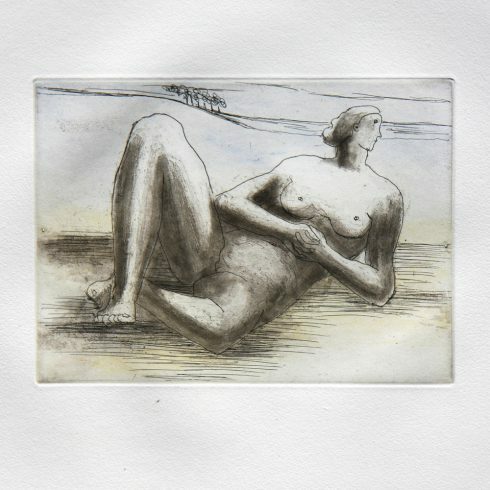 Our Fine Art Gallery has the finest quality Henry Moore original prints, lithographs, etchings, aquatints and posters. We have a large inventory available off-site and we encourage you to make an appointment to see specific works you are looking to collect. We are happy to meet you at either our art gallery showroom or at your home or office for a private presentation. Henry Spencer Moore was born on July 30, 1898, in Castleford, Yorkshire the seventh of eight children. Despite an early desire to become a sculptor, having learned of the achievements of Michelangelo at the age of eleven, Moore began his career as a teacher in Castleford. After military service in World War I he attended Leeds School of Art on an ex-serviceman’s grant. In 1921 he won a Royal Exhibition Scholarship to study sculpture at the Royal Academy of Art in London. Moore became interested in the Mexican, Egyptian, and African sculpture he saw at the British Museum which, to him, exemplified the ideal of vital force and formal vigor. He was appointed Instructor of Sculpture at the Royal Academy in 1924, a post he held for the next seven years. A Royal Academy traveling scholarship allowed Moore to visit Italy in 1925 where he saw the frescoes of Giotto and Masaccio and the late sculpture of Michelangelo. Moore’s first solo show of sculpture was held at the Warren Gallery, London, in 1928. In the 1930s Moore was a member of Unit One, a group of advanced artists organized by Paul Nash, and was a close friend of Barbara Hepworth, Ben Nicholson, and the critic Herbert Read. From 1932 to 1939 he taught at the Chelsea School of Art. He was an important force in the English Surrealist movement, although he was not entirely committed to its doctrines; Moore participated in the International Surrealist Exhibition at the New Burlington Galleries, London, in 1936. In 1940 Moore was appointed an official war artist and was commissioned by the War Artists Advisory Committee to execute drawings of life in underground bomb shelters. According to Moore “I spent the time looking at the rows of people sleeping on the platforms. I had never seen so many reclining figures, and even the train tunnels seemed to be like the holes in my sculpture.” From 1940 to 1943 the artist concentrated almost entirely on drawing. Moore’s first retrospective took place at Temple Newsam, Leeds, in 1941. In 1943 he received a commission from the Church of St. Matthew, Northampton, to carve a Madonna and Child; this sculpture was the first in an important series of family-group sculptures. Moore was given his first major retrospective abroad by the Museum of Modern Art, New York, in 1946. He won the International Prize for Sculpture at the Venice Biennale of 1948. Moore executed several important public commissions in the 1950s, among them ‘Reclining Figure’ 1956–58, for the UNESCO Building in Paris. From the late 1960s Moore worked a good deal as a printmaker creating several series of etchings such as ‘Elephant Skull’ and ‘The Sheep Portfolios’. In 1963 the artist was awarded the British Order of Merit. In 1978 an exhibition of his work organized by the Arts Council of Great Britain was held at the Serpentine in London, at which time he gave many of his sculptures to the Tate Gallery, London. In 1977, Moore set up the Henry Moore Foundation in order to advance public appreciation of art, especially his own work, and arranged numerous worldwide exhibitions. Moore died in Much Hadham, Hertfordshire, on August 31, 1986 and in September 2000 Moore Square was opened on the site of his Castleford birthplace.